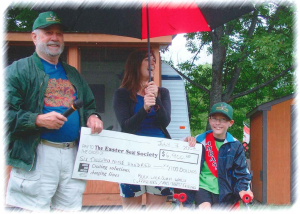 Every year, the Buck Lake community raises money to send children to Easter Seals Camp Merrywood. The primary fund raising event is the annual boatilla. Volunteer canvassers usually collect donations from their neighbours to support Camp Merrywood. Donations can also be made at the camp ground following the Boatilla or on line at the Easter Seals Donation Page. The Buck Lake community can be justifiably proud of many aspects of living in our little piece of paradise in South Frontenac Township. One such aspect is the annual Boatilla that sends physically disabled children to Camp Merrywood, a specially equipped summer camp on the Big Rideau operated by Easter Seals. There these ‘Sent to Camp’ kids get to enjoy for ten days what we Buck Lakers enjoy throughout the whole summer or, some of us, year-round. Ironically, the Buck Lake Boatilla traces its origins back to an outbreak of petty crime in the 1990s. In response to a rash of break-ins, theft of gas tanks from boats, and the like, some ‘take charge’ members of the community formed a Neighbourhood Watch and recruited others to conduct regular patrols and keep their eyes open for trouble. The crimes stopped when the “Usual Suspects” left Buck Lake. It was not long before the organizers, Rick, Ron, Boyd, Steve, and Roscoe, decided the Watch was no longer necessary. Rather than disbanding, they cast around for another useful purpose for the organization. They decided on supporting Easter Seals’ Camp Merrywood and created the slogan “Send a Kid to Camp”. That was in 2005, the start of the Buck Lake Boatilla. That first year was both hilarious and a bit scary. It was before the Boatilla Committee got the idea and Randy Ruttan and his campers agreed to have the participating boaters and others assemble for a barbecue at the Hidden Valley campground at the end of the parade of boats. The plan on that first day was for the boats to assemble at the culvert, parade around Pulpit and Buck Islands, and re-assemble in a sort of ‘floatilla’ in Christmas Bay. There was no advance canvas for funds; instead the suggestion was that people would donate $5.00 for every person on their boat, the collection being done by Ross Trudel being driven from boat to boat. It was a great plan, but it didn’t allow for the strong wind and high waves that day that made the ‘floatilla’ part impossible and produced any number of near dunkings as Roscoe precariously attempted to do his collections without ramming anybody. It was quite a show, but a successful one that raised $3,750, enough to send nearly two kids to Camp Merrywood; the goal had been funding enough for one. In those days it cost $2,000 per child; more recently the cost has increased to $2,500. The high cost is due to the need for a very high staff to camper ratio combined with the Camp’s having comprehensive health care services on site to keep the children safe and also with the specialized equipment needed for them to overcome the limits of their physical disabilities. Each year since 2005, the Boatilla has grown both as a charitable and a community event. Thanks to Randy Ruttan and the campers, many of whom participate actively, that first frustrated ‘flotilla’ in Christmas Bay was replaced shortly thereafter by a community barbecue at the Hidden Valley campground. The campers, largely from the United States, are not only generous contributors to Camp Merrywood, they share their space with the Boatilla participants, and some do the cooking as well as sharing in the fun. Another more recent innovation has been live music at the wind-up BBQ. This has been provided by Kaz’ band, a father associated with the Kingston Symphony Orchestra and his two daughters. A feature number in the last two years has been an original song written and sung by Kiera, a Merrywood camper, who has come with her parents several times to the Boatilla. Another speaks well for the future. About four years ago, some children from Hidden Valley spontaneously showed up with a little plastic cash register and put on a bake sale, all proceeds (over $300) going to the Boatilla. It was a surprise to everyone except, of course, their parents who no doubt furnished encouragement, cooking skills, and the baked goods’ ingredients. In the same spirit of giving, other children on Buck Lake have put on a book sale and offered lemonade from a dock in the narrows with the proceeds earmarked for various causes, including cancer research. The Boatilla’s contributions to the Buck Lake community are hard to measure. It certainly contributes substantially to our community’s pride, its identity, and to the pleasure its seasonal and full-time members derive from their participation in it. Its contribution to Easter Seals is relatively easily measured in terms of the money raised for Camp Merrywood. Its contribution to physically challenged children is partially counted by the number of kids sent to camp. Getting measures of what going to camp means to those children, their enjoyment, development, self- assurance, and the respite provided to their parents is significant but not easily measured. The measurable results, so far shown in the cart below.